"Oh, isn't it adorable?" Madeleine asked. 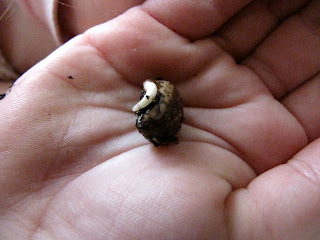 She had to hold it for a while... and then I talked her out of plucking it off of the rest of the seed. We'll check it again in a few days for root hairs, (we re-buried it, hopefully it will still live) and then wait for it to sprout. Seed experiments are so fun! I love your baby pics in the above posting--spring is in the air! Isn't that the most fun for kids!